Sometimes you have to wonder what Nikon is thinking. The J2 was introduced just four-and-a-half months ago, and today it's essentially been superseded with a bifurcation of models: the S1 and J3. It's almost like there are random mutations happening in the Nikon lineup to produce Nikon 1 models (more on that in a bit). Worse still, it appears that marketing has no idea what to do with this sudden proliferation. As I write this, the J1 is listed on Nikon's site at US$650, the J2 at US$550, and the J3 at US$600. That makes no sense at all, and just stalls existing inventory in place. The new Nikon J3 is easy enough to describe: it's basically the J2 with the V2's sensor. You also get a new pano mode, support for the WU-1b wireless option, and the camera has dropped a tiny bit in size and weight, but a J1 or J2 user would easily pick up a J3 and just pick up shooting where they left off. The Nikon S1 is a little tougher to describe. The S1 seems to be the J1 basics in a cut-down body, with a few of the feature additions/changes of the J3 (e.g. WU-1b support). At US$500 list, it becomes the lowest priced Nikon 1 model. So, 1, 3, 2. Yeah, that makes sense. Not. One wonders whether Nikon will ever get their numbering coincident. After all, next year's models will probably now be the S2, J4, and V3. Olympus makes this same mistake with the Pen lineup (E-PM2, E-PL5, E-P3), as does Panasonic (G5, GF5, GX1, GH3). Why is this a mistake? Well, why you want a one (S1) when you can have two (J2) or a different one (V1) at a lower price in end-of-life discounting? Essentially you keep stalling your inventory turnover the way Nikon is naming and pricing the Nikon 1 models. Along with the new cameras, Nikon gave the Nikon 1 user base some love, too. The 6.7-13mm f/3.5-5.6 VR (18-35mm equivalent wide angle zoom) and compact 10-100mm f/4-5.6 VR (28-280mm super zoom) lenses were also officially announced and should be available soon, plus a new underwater case for the J1 and S1 (WP-N2) was announced. Database pages for the new products have been added to this site. 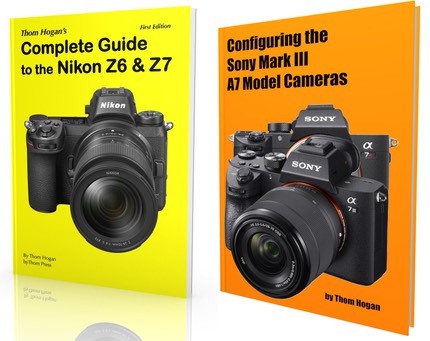 Now about that "more in a bit" thought: It seems that Nikon is pushing the Nikon 1 line down (and slightly up) at the moment, which is one of the reasons for the model proliferation. This leads me to speculate that Nikon thinks that the Nikon 1 is the replacement for some of the Coolpix line. Imagine an L1: create an S1 with a plastic body and no interchangeable lens. Price it at US$400 initially. That comes very close to the P310 in almost all respects, but is a faster focusing camera with a larger sensor and better video. The problem, of course, is that Nikon is getting all kinds of overlap with the Nikon 1 models: overlap to the high Coolpix line, and overlap in pricing to the low end DSLR line. It's not yet clear why you buy a Coolpix, Nikon 1, or Nikon D#### model to many people. The territory is also pretty constrained. Compact cameras currently range from US$150 to US$750, with most lines topping out around US$500 (the large sensor Sony RX-100 is an exception). DSLRs tend to range from US$600 and up. That leaves very little space in between for mirrorless. Some overlap is inevitable. But it seems to me that none of the camera makers have come close to rationalizing their price/performance, and Nikon is one of the worst offenders. I can imagine a future Coolpix line at US$200-500, a future Nikon 1 line from US$400-800, and a future DSLR line from US$600 and up. But for that to completely work, we need lots of fixes in the Nikon 1 line (including a true high end model) and better price/performance rationalization in the Coolpix/Nikon 1 overlap. The ingredients are mostly there, it's the menu that isn't making sense at the moment.